I thought I’ll share a little with my impressions from Gamescom. 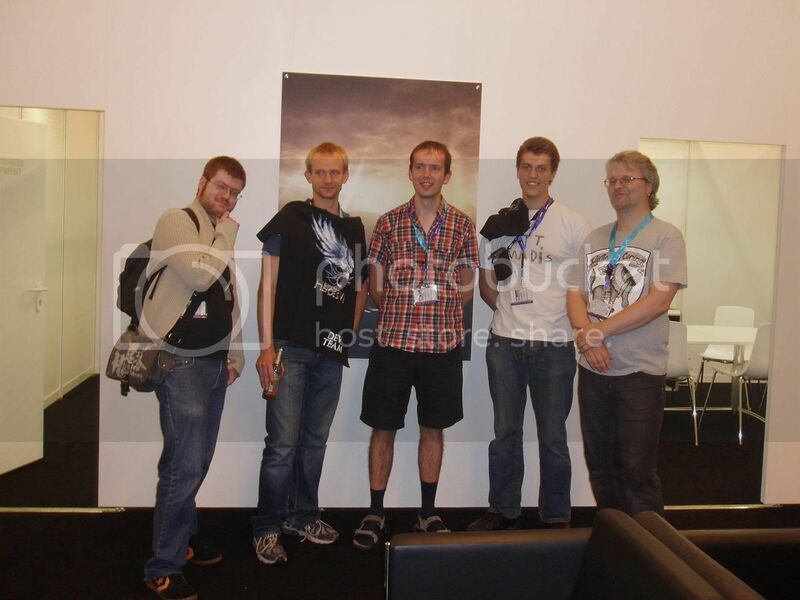 To start with, I was one of the lucky guys who was invited by Ubisoft to come to Gamescom where was announced Heroes VI. Since Ubi offered to cover most of the travel and accomodation expenses, the decision whether to come or not was a no-brainer! The demo presentation happened in the Gamescom business section which is off-limits for all visitors so we had to wait outside until Ubi Might and Magic community developer Noemie Verpeaux aka Xhane came out and handed us VIP badges to get in. Once inside, we were met by the Heroes VI producer Erwan LeBreton, Julien Pirou aka Marzhin (whose new post is no longer a secret as I see! ), associate producer Max von Knorring and other Ubi guys. I mean, the whole meeting with familiar faces known only from forum discussions felt so weird and exciting at the same time – like meeting friends you’ve never met! We had a small chat and then the demo started. 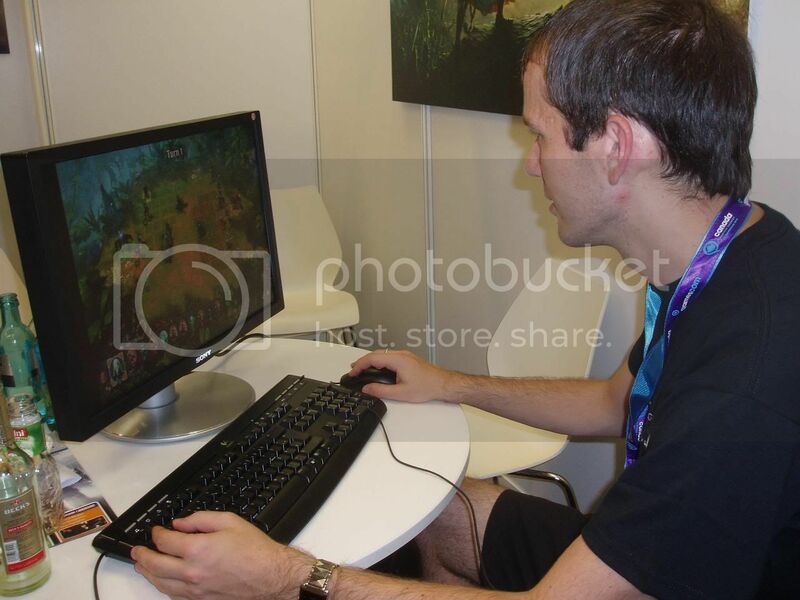 Since there were also journalists at the presentation, Erwan briefly explained what Heroes VI is all about, the official trailer was shown (which to a great disappointment for the devs was leaked at least 2 days earlier) and then goes the demo. As we were explained later, it was a fake map which won’t be used in the final product so it’s only purpose was to demostrate game’s capabilities. The game engine looks very similar to Heroes V but as it happens, it’s an entirely different engine created by Black Hole Entertainment. It’s just that since the game is still very much WIP and at the pre-alpha stage, it uses a lot of placeholders, so NOTHING you see in the leaked and officially released pictures is carved in stone. In the demo map necro hero Sveltana (the chick from the official trailer) can move around and kill a few wandering neutrals, grab a few artifacts and capture a Haven town. Then Sveltana can proceed with transforming the town to Necropolis and proceed to a portal where she’s about to have a boss fight. Once she comes closer to a pond, a huge blue snake-like-monster emerges from the water and flies around. The screen fades and we are shown some awesome new landscapes in the game – the underground looks just terriffic! • The game style feels much more mature – no more kiddie artwork and the infamous „Griffin Eternal!” Even Erwan admitted himself that the frequency using the last quote in H5 was a bit over the top. • The adventure map objects are a lot more detailed and I think you can zoom in even closer than in H5. • Even though the adventure map remains 3D, you will no longer need to rotate the camera in order not to miss an artifact or a resource lying somewhere behind trees. Everything will be visible from every angle. • There will be boss fights every second scenario. We didn’t get to fight against the blue giant snake thing but we did learn that they will have unique size in the combat. Meaning, there might be a boss who could fill even half of the combat area. Since the size of the snake monster might be around 2x8, 2x2 no longer will be the largest creature in the game. • There will be artifact sets. • The initiative is no longer in the game – every creature will have just one action per turn. • One of the most interesting innovations is fort which controls all mines in some radius. Which means, who controls the fort, controls the mines. • You can add your own shortcuts in the adventure map – for example, open a hero’s inventory and drag his avatar to wherever you want on the screen. Thus you can always easily access his inventory by one click. I assume you’ll be able to do the same with towns. Similarly it works in the combat – you can select your favorite spells from spellbook and drag them to the combat screen so that they work as your quickspells. They remain there until the end of the scenario or when you remove them. • The town screens will be there, and in 2D – they’re just not yet implemented. • Hans Zimmer isn't involved in the project but his music was used as an inspiration already in Dark Messiah. I might remember something more later. As a nice present we got our very own Heroes VI developer T-shirts and it felt really great walking around the Gamescom halls – I did feel a lot of guys staring at us. At least 5 had a courage to ask us whether we are H6 devs, when it’s going to be released, where can they get such a cool T-shirt and stuff. But the most funny part happened when we went to the King’s Bounty section – I was greeted by one of their developers who asked how are we progressing with the game. I did reveal that I’m just a fan but I assured him that there are a lot of KB fans at Celestial Heavens which he was happy to hear. We had another Heroes VI demo presentation also the next day and this time we were joined by a developer from Black Hole Entertainment – lead designer Gabor Szabo. During a dinner in a restaurant we talked about a lot of things but it was so awesome to see that they truly love what they do, and not only Black Hole, but also Ubi. That was the most assuring thing I saw during my visitation – that the game is in good hands, it’s not just a yet another project for them, and then there’s Marzhin who as a promoted fan will always keep them in line! Last edited by arturchix on Aug 23 2010, 16:17, edited 1 time in total. whats that in the 2nd picture you posted? a skeleton archer? I remembered another thing - speaking about the map editor, for the fans will be released the same editor which is used by Black Hole to create the game, only a bit more user-friendly. Thus it won't be the same like with Nival when they realized - right, the game is finished, now we only need some kind of a map editor for the fans. The devs are very much aware of the H5 map editor shortcomings and want to improve things this time. The official release date for the game is March 2011 but I doubt it will make it in time and could be delayed. Hey! Thanks for the informations! Do you know anything about a video about the event? A video about the program or maybe a direct feed of the demonstration gameplay? Since it was good enough to show there to the public I hope we'll get a video about it too. I can't find anything on youtube. I did make a video when the demo was presented but I can't upload it, only pics, sorry. I think Xhane will write a report on what happened there, she was filming as well so let's wait for that one. Another thing - I reminded Erwan that H5 basically had no normal Haven campaign since the first one is a huge tutorial and he said that it's going to change in H6. Meaning, there will be a tutorial map but optional and the players will be able to skip it and start with the real campaign. If I remember correctly, there will be 20 scenarios from all campaigns in total (don't remember if it was 4 scenarios in 5 campaigns or vice versa) and you won't be forced to play the campaigns in a specific order. However, finishing them all will unlock the final campaign. The guy on the left is Marzhin, I believe. Yep, and me in the middle. I don't know if I can disclose who the other guys are but maybe someone of you know at least one of them. Kalah wrote: The guy on the left is Marzhin, I believe. Gosh, am I that famous already ? • There will be boss fights every second scenario. I never got this fetish for symmetry... boss fights should be dictated by story first, and not the other way around. Did you get to see it in action? How does this work exactly? Will they actually show changes individually, or is there some town level system?! Thanks for all this new info! So Hans Zimmer is out, but a fellow from Heroes Community asks if the devs told you who will be composing for H6. Paul Romero and Rob King? Thanks, arturchix - great news in my book! Corlagon wrote: Thanks for all this new info! I for one was looking for the white streak first... you avatar 'shoping scum. arturchix wrote: Yep, and me in the middle. I don't know if I can disclose who the other guys are but maybe someone of you know at least one of them. znork, Alderbranch, and Gunnar, couldn't say who is who though. "The clues are out there.....S.N.A.F.U." Last edited by Corlagon on Aug 23 2010, 19:36, edited 1 time in total. Great report ... even if I'm also majorly dissapointed about the dropped Initiative system, possibly the single greatest addition to the series from Heroes 5. Last edited by alcibiades on Aug 23 2010, 16:55, edited 1 time in total.